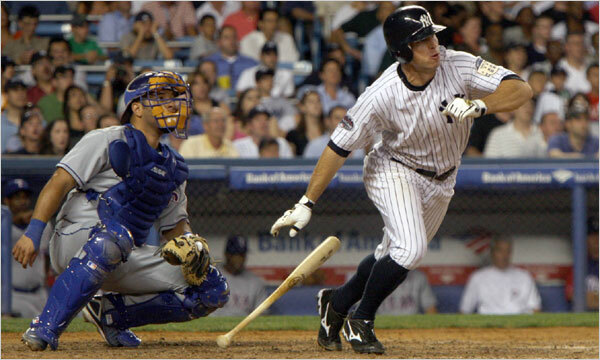 Boy of Summer: Brett Gardner: Put me in Coach! I'm Ready to Make Outs! Brett Gardner: Put me in Coach! I'm Ready to Make Outs! The Yankees are reportedly planning on letting Brett Gardner be the regular center fielder this year, at least until he demonstrates that he can't handle the load. In my mind, his four seasons of fairly lackluster performances in the minor leagues have already demonstrated that. "I just don't get why Girardi has such a Gard-on for this guy. You'd think they were having an affair or something." In addition to the unimpressive competition and the fact that he has not hit one out since March 9th, those three homers equal the total he hit in 341 at-bats in AAA last season, or one third of his entire professional career home run total, in 381 games. So, while it's possible that Brett suddenly somehow acquired the power he has always lacked, it's more likely that this is a fluke, and Gardner won't hit more than one or two homers all year, if he plays daily. In somewhat related news, the Yankees announced last week that Derek Jeter will be moving back into the leadoff spot, a role in which he has performed admirably at various times in his career. Indeed, Jeter's career line in the #1 hole (.315/.389/.471) is almost exactly the same as his overall career line (316/.387/.458). Despite his weaknesses, one of Jeter's greatest strengths as a player is his ability to adapt, and to do what needs to be done, regardless of changes in circumstance. If there's anyone who can be shuffled around the lineup to help the team function better as a whole, it's Jeter. So, they don't need their centerfielder to also serve as the leadoff man, as Damon did for the last few years. That should help Gardner a bit, dropping him back down to the bottom of the order, where the lower pressure may allow him to thrive. Or, more likely, where the lack of protection in the order will enable opposing pitchers to challenge him, and his weak bat will be exposed all the more. ... Here’s what Gardner isn’t: a power hitter. Here’s what the Yanks don’t need: A power hitter. What DO the Yanks need: A CF with speed and a hitter who can get on and help manufacture a run. Tell me I am crazy, but if Gardner’s on first, they are going to hit and run like mad as Jeter is so adept at slapping the ball towards rightfield. As the 2B goes to cover the base (Jeter being righty and all), that creates a massive hole for Jeter to try to shoot the ball thru. Gardy’s going first to third alot this year. With all due respect, Jason, power hitter, schmower hitter. And that "if" Gardner's on first should by no means be taken lightly. Gardner's just barely a "hitter" at all. His career minor league line is .291/.389/.385, with nine homers in almost 1700 plate appearances. Baseball Prospectus' 75th percentile projection for him is only .266/.353/.375, which last year would have given him an OPS that ranked 125th out of 147 major league batters. In other words: He'll have to defy three-to-one odds just to be awful. Gardner's 90th percentile projection from Baseball Prospectus (meaning that roughly 1 out of ten players with a similar profile do this well) is .288/.376/.412. That's statistical speak for "moderately useful" or about as well as BJ Upton did last year. But Upton is younger, more experienced, and still has potential, as everyone expects him to hit with more power, in addition to the speed and the newly found patience he exhibited in 2008. Gardner would be maxed out at that level, with nowhere to go but down. Unless Gardner is saving dozens of runs with his glove and those speedy legs, there's no way he should be a viable option for a team trying to win a championship, not for more than a couple of weeks as a stopgap. More likely he'll compile numbers closer to BP's weighted average, which is .252/.339/.350 (689 OPS), and which would make Gardner one of the dozen or so worst regular hitters in the major leagues this year. Those are the minor league stats for the two players (complements of the Baseball Cube) and they are eerily similar. Other similarities include that they're both an inch or two under six feet tall, with listed weights of 180 lbs. Both bat lefty and play center, and Gardner, like Bourn before him, will get his first shot at extended playing time in the majors at age 25. If there is any difference to speak of, it's that Gardner struck out 10% less often in the minors than Bourn did, which may suggest slightly better bat control, but not much else. It should also be noted that more than half of Bourn's numbers were compiled at AA, while Gardner's were spaced pretty evenly between Single A (both high and low), Double-A and AAA. If you look at their college numbers, at first glance it appears than Gardner (.382/.456/.508) was a vastly better player than Bourn (.320/.431/.371) but this is largely a result of context. Gardner went to the College of Charleston, in the Southern Conference, with such luminous institutions as Wofford, the Citadel, Appalacian State, and Elon College (long live the Fighting Christians!!!). During the three years that Gardner attended college, there were 33 different players drafted from that conference, and four of these have made it to the majors, at least briefly. Among these, the best (so far) is probably Tom Mastny, a nondescript relief pitcher in the Cleveland organization. By contrast, Bourn attended the University of Houston, in Conference USA, with much larger schools like Tulane, UNC-Charlotte, and Texas Christian. In his three years, there were 66 different players drafted, and 12 of these have been in the majors for some span of time. The best of these are Chad Tracy, Jesse Crain, Dan Uggla and Kevin Youkilis. Clearly, Bourn was up against much stiffer competition. So it looks like the differences in those college numbers are a wash, too. This, of course, is largely irrelevant now, since we have close to 400 minor league games to examine for each player, a much better indicator of future major league performance than college numbers are. And those numbers suggest that Gardner will be one of the fastest and most prolific outmakers in the major leagues this year. On another team, he'd be a great bet to rack up 50 steals and 500 outs, but I think the Yankees will grow tired of his act by the end of May, and either Damon or Swisher will be out patrolling center field. The Yankees can afford to take a hit on defense if it means they'll get reasonable production from their hitters. Either that, or they'll end up trading for someone they think can play regularly, eating a lot of salary in the process. Someone like Aaron Rowand or (God help us...) Juan Pierre. I hope Gardner is the real thing. I don't want Juan Pierre in the worst way.